St. Frances (Md.) 2020 Guard Ace Baldwin. St. Frances (Md.) 2020 guard Ace Baldwin had a strong junior season, averaging 15 points, 6 assists and 4 steals per game while leading the Panthers to the Baltimore Catholic and Maryland Interscholastic Athletic Association A Conference titles. 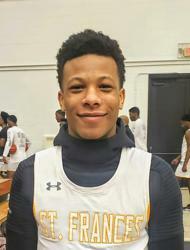 The 6-foot, 180-pound Baldwin was at his best when it mattered, hitting game-winning buzzer beaters in two of St. Frances' biggest contests - Memphis East (TN) in the Chick Fil A Classic in December and St. Maria Goretti in the BCL title game earlier this month. WHAT WAS THE KEY TO YOUR SUCCESS THIS YEAR? DID THE SEASON GO THE WAY YOU HOPED? HOW EXCITED ARE YOU FOR THE SPRING AND SUMMER? WHAT IS IT ABOUT BASKETBALL THAT YOU LIKE? IF YOU HAD TO PICK A FAVORITE BASKETBALL MEMORY WHAT WOULD IT BE?